The workshop took place from September 29 and will end at October 1, 2016. It has been organized by the United Evangelical mission in collaboration with EPR and the Anglican church of Rwanda (Shyogwe, Kigeme, Cyangugu and Kigeme Diocese). 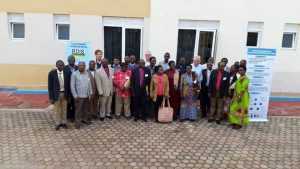 The participants to this workshop come from different churches member of the United Evangelical Mission, a Christian organization based in German. They are mainly come from Rwanda, Tanzania, DRC, Germany, and Asia. This workshop will be honored by the presence of different officials from the Ministry of Environment, Ministry of Finance, National Bank and Rwanda Development Bank. On 29th September, participants had chance to visit the Rural Development inter-diocesan service stove project in the Anglican Church of Rwanda, Shyogwe diocese. During this exposure, the Rt. Rv. Dr Jered Kalimba took the opportunity to present to the participants the philosophy of the church towards the stewardship of god’s creation in these words: Today’s exposure visit aims at sharing with you the work being done by our four dioceses through the Rural Development Inter-diocesan Service which is a church right hand meant to bring about social and economic development in the Southern and Western provinces of Rwanda. As we all know, the earth and all life on it are Integral part of God’s creation. We are called to safeguard and take care of it. In the very beginning of time, God created all that is, and proclaimed it good (Genesis 1:1–31). He instructs us to “cultivate and care” for creation (Genesis 2:15). God also told Moses to make sure the Israelites let their land lie fallow every 6 years, giving the land itself a Sabbath, or time to rest (Leviticus 25:4–5). The Scriptures remind that creation belongs to God and reveals his goodness (Romans 1:19–20, 1 Corinthians 10:26), which invites us to respect our Creator by caring for nature. Take measures to reduce the harm that ourselves do to the environment. Encourage our local churches and local communities to adopt policies and practices that minimize environmental damage through establishment of environmental clubs in church schools, Vocational training centers etc. We must admit that keeping the environment clean and unpolluted, caring for all species, leaving the earth as undamaged as possible for the next generation models respect for our Creator, love for our fellow human beings (even those yet to be born), and the selflessness of Christ to a self-consumed world. Christians are thus urged to take the lead in ensuring that the beauty and majesty of God’s creation are sustained. We believe that these efforts will help ensure the protection and health of future generations, will be a blessing to people all around the world (especially the poor), will improve our witness to a watching world, and most of all, will express our love and worship for our Creator, Redeemer and Friend. Mfite ubwoba ko mujya gukora ibintu byinshi kandi mufite ubushobozi buke, bityo bigatuma muhora muvunika kandi umusaruro wanyu ukaba muke.